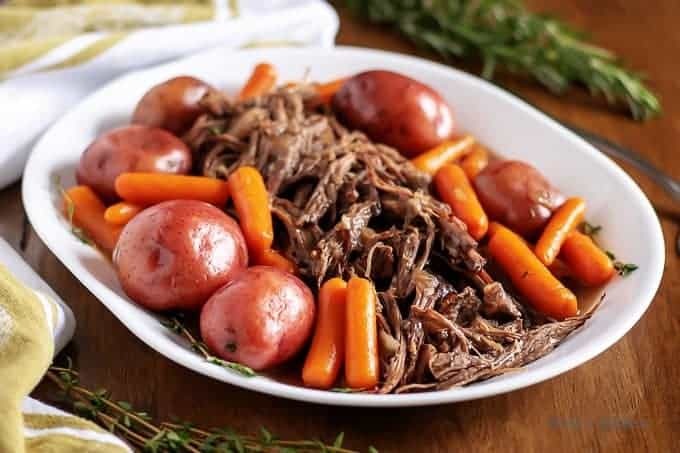 Tender and juicy Instant Pot pot roast with carrots and potatoes seasoned with our own blend of spices and smothered with a red wine infused sauce. 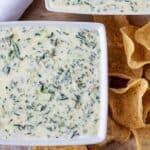 First things first, let’s talk about the title of this recipe. It’s awful, I know, but try and keep in mind that we have to play the SEO game. 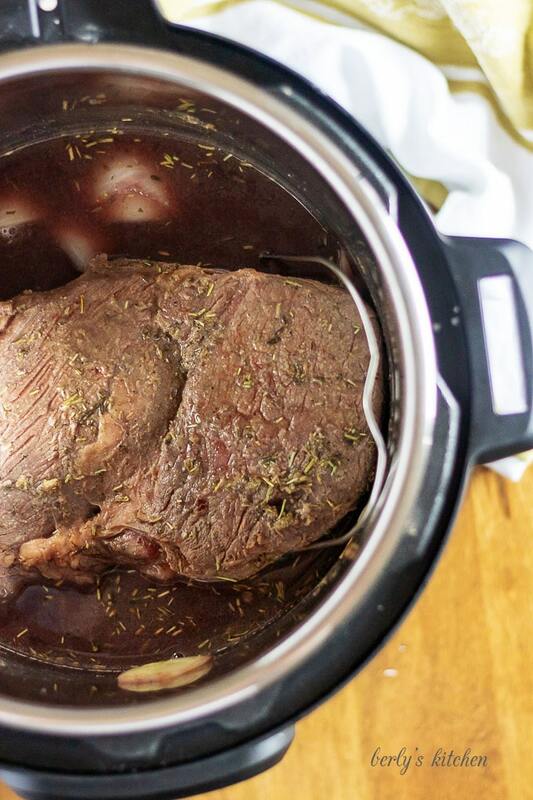 So, as, “cringe worthy,” as it sounds, Instant Pot pot roast is here to stay. 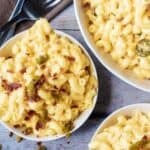 Now that I’ve gotten that out of the way, how about we talk a little about the recipe and my plans for the rest of the post? Okay, I was surprised by how well this turned out. Kim is a wonderful cook, but when she ordered our Instant Pot, I wasn’t happy about it. As someone who worked under a chef, appliances like pressure cookers make me roll my eyes. For me, cooking means a lot more than just trying to stuff my face. It’s a about passion, love for food, and most importantly, the act of cooking is the ultimate display of affection. One of the first things I did for Kim was cook her breakfast. The previous night had been amazing, but I needed show her how much I cared by creating a special meal, just for her. Know what I’m saying? The point is, the kitchen is no place for shortcuts; especially, when making food for those you love. In spite of all that, I have to remind myself that not everyone feels the same way as me. That’s why we swallowed our pride and started working with the Instant Pot. Fast forward to today and Kim and I are making meals in this thing that I honestly didn’t think were possible. This Instant Pot pot roast turned out tender, juicy, and flavorful. Combine that with a red wine infused sauce and you have a pretty sweet meal on your hands. Ordinarily, this is the point in our posts when I would give more detailed instructions about the recipe. Since Kim already gave detailed ones in the recipe card, I won’t bore you with duplicate content. Instead, I will pick out a few steps to review and add a little useful information. In other words, elaborate on her instructions. You’ll notice Kim created her own blend of spices and made a, “dry rub,” for the pot roast. You don’t have to do this, you can use a seasoning mix or packet from the store. Additionally, she allowed it to rest before starting the cooking process. Doing so ensures the meat gets properly seasoned. The longer it sets, the richer the flavor. Furthermore, that flavor cooks into the vegetables and potatoes in the dish. In addition to properly seasoning the meat, she also seared it. Let’s talk about why she seared the meat. What you may not know is that when searing something, it creates a crust and seals in the juices. That, in turn, keeps them from leaking out while it finishes cooking. Anytime you work with red meat, it’s a good idea to crank up the heat and give it a good sear before roasting. Once that step is done, using the drippings from the beef to saute the onions is always a good idea. All that beef flavor is mixing with the vegetables and you can’t go wrong with that. Also, using red wine or beef broth to de-glaze a pan is another way to impart flavor. Ideally, the little bits of meat that stuck to the bottom of the pan will come loose, then adhere to your vegetables as the liquid evaporates. If the term de-glazing throws you off, don’t let it. Something as simple as making sausage gravy uses a de-glazing step. In other words, if you’ve made gravy, then you’ve de-glazed a pan. A quick word on cooking with spirits and wines, don’t let the alcohol bother you. I know some people don’t drink due to health or religious reasons and I totally understand. Due my health issues, drinking is a rarity. However, when a wine cooks for this long, I promise you, the alcohol has cooked out via evaporation. All that’s left is the flavor, which adds a rich, fruitiness to the dish. All I’m saying is, try it before you judge. Besides, you’d be surprised how many restaurants use wine in their dishes, but don’t list it as a main ingredient on the menu. The last thing I will talk about is the sauce for our dish. A lot of people are going to say, “That’s not a sauce, that’s gravy.” Well, that depends on your definition of a gravy. For me, gravy requires a liquid (water, wine, milk, broth), a fat (butter, grease), and a four (all-purpose, wheat, blend). Since we used cornstarch as the thickening agent, I don’t consider it a gravy. If you do, that’s fine, you can call it that. In closing, I would like to recommend pairing this heavy meal with a light salad of your choice. Well, other than a few tips below, that’s all I’m going to add to the post. 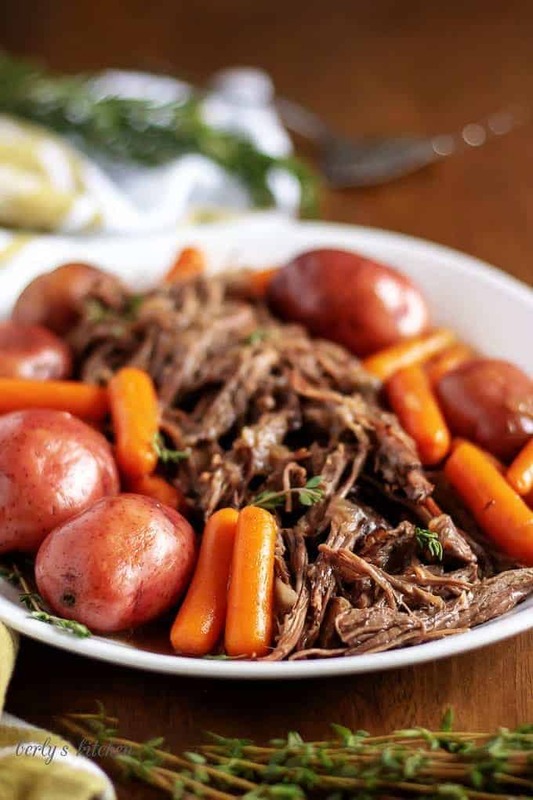 Kim and I hope you enjoy this Instant Pot pot roast recipe. For those of you who like your pot roast medium to medium-well, I would recommend cutting down the cook time, not the release time. Remember, the natural release is how the Instant Pot keeps meat tender and succulent. Or you could cut it into chunks, then sear and cook it (think beef bourguignon). You could make gravy, instead of sauce, by removing the meat and veggies, turning the pressure cooker back on to saute, melting 4-tablespoons of butter in the broth, and whisking in about 1/4-cup flour. As the broth heats and cooks the flour, it will thicken into a gravy. The vegetables can be added directly to the pot, without foil; however, they will be extremely soft when done (almost mushy). Want an extra dose of flavor? Consider adding an aus jux packet to the broth. Be warned, we have NOT done this, so it could get way too salty. 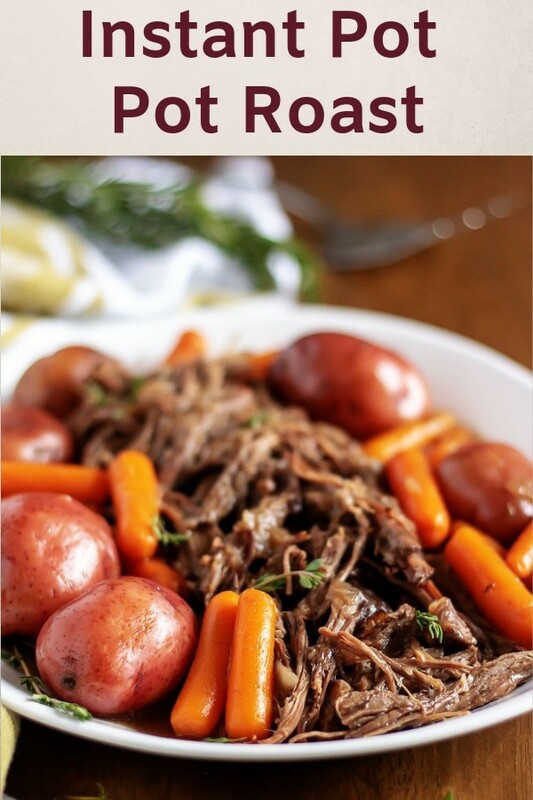 If you like this pot roast, please leave us a comment and rate the recipe card. You can also find us on Facebook, Pinterest, Twitter and Instagram searching for Berly’s Kitchen! In a small bowl, combine the garlic powder, onion powder, salt, pepper, rosemary, and thyme. Apply the seasonings to the all sides of the roast, and message in like a dry rub. Allow the roast to rest for at least 30 minutes before proceeding. 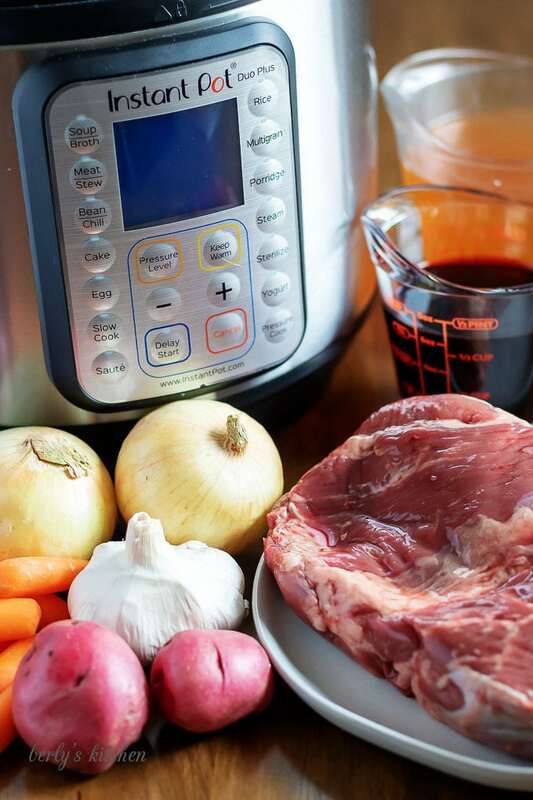 After the roast has rested, turn the Instant Pot on using the saute function. After the liner gets hot, add the cooking oil. Place the roast into the Instant Pot, and sear on each side for 3 to 5 minutes. Remove the roast, and set aside. 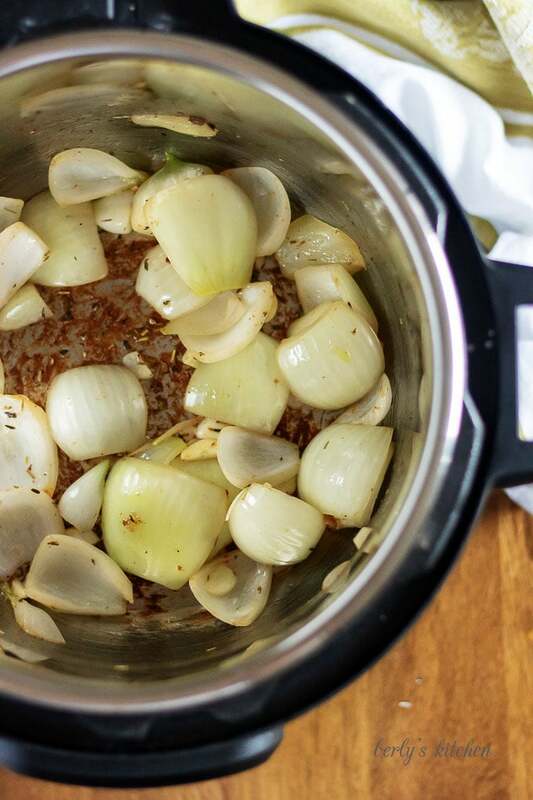 Place the onions into the hot Instant Pot. Saute for 3 to 5 minutes until the onions begin to soften. Add the garlic, and saute an additional 30 seconds. Pour in the wine, and deglaze the pan. Make sure to scrape any bits of foods that may be stuck to the bottom of pot. The bottom of the pan needs to be as clean as possible prior to pressure cooking. Pour in the beef broth, then place a trivet into the pot. It’s helpful to have a trivet with handles like the one that comes with Instant Pot. Close the lid, and set the valve to sealing. Use the manual (pressure cook) button to adjust the time to 50 minutes. After the time is up, allow a 20 minute natural release. Meanwhile, make the cornstarch slurry. In a small bowl, whisk together the cornstarch and cold water until smooth. Set aside. After a 20 minute natural release, open the valve to release any remaining pressure. Carefully open the lid, and remove the vegetable packets and pot roast. 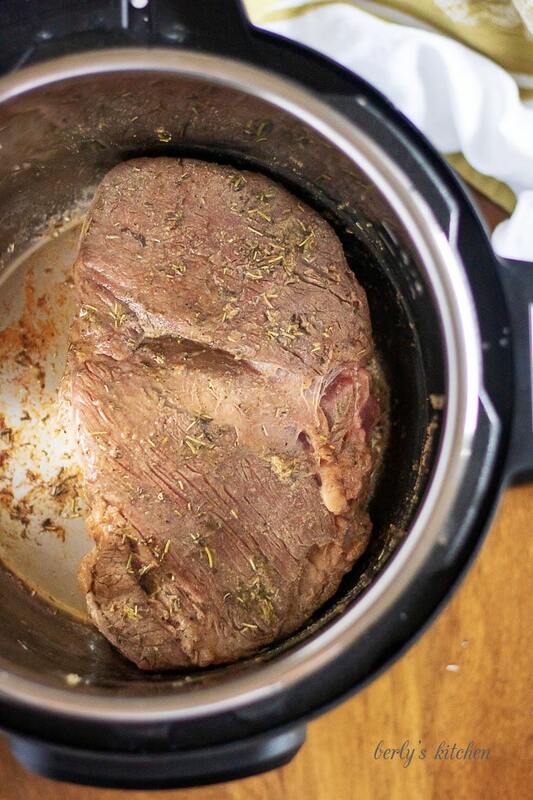 The pot roast needs time to rest before it’s cut or shredded to ensure the juices are retained. While it rests, make the sauce. Remove the trivet from the Instant Pot, leaving only the liquid. 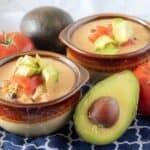 Turn the Instant Pot on, using the saute function. Pour in the cornstarch slurry and whisk to combine. The sauce will thicken as the sauce heats. Make sure to continue to whisk, so the sauce won’t stick to the bottom. 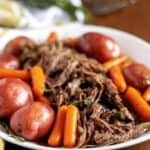 Once the pot roast rests for several minutes either cut it into chunks or shred it with forks. The roast and vegetables can be added back to the sauce, or the sauce can be ladled over the meat and veggies. Serve hot. Store any leftovers in a sealed container for up to 3 days in the refrigerator. The calories listed are an approximation based on the ingredients and a serving size of 1/4 the total cooked recipe (approx. 4-6 ounces of roast, 1-2 potatoes, 2-3 baby carrots). Actual calories will vary. The pot roast can be stored in your fridge for up to 3-days in a sealed container.